Why is Peace Hub using Egypt as an example to call for an arms embargo on countries using repression? In 2013 10 licences were granted by the UK to export arms to Egypt, mostly components for military vehicles and imaging cameras. While these supplies may seem less harmful than guns or bullets, the Egyptian security services rely on these supplies to maintain military power and repress peaceful opposition. A human example of the impact of this repression is the human rights defender, Yara Sallam. She has spent many years working to promote women’s rights in Egypt, and in 2013 was awarded the ‘African Shield’ for defending human rights. She was arrested on 21st June 2014, along with 24 others, for taking part in a peaceful protest and faces 5 years imprisonment if found guilty. The protesters were attacked by a group of men in civilian clothes before being detained by the security services. These security services rely on imported arms – including the military equipment sold by the UK. You can find out more about the human rights situation in Egypt from Amnesty International. At Peace Hub, you can take action to help stop the UK selling arms to Egypt. 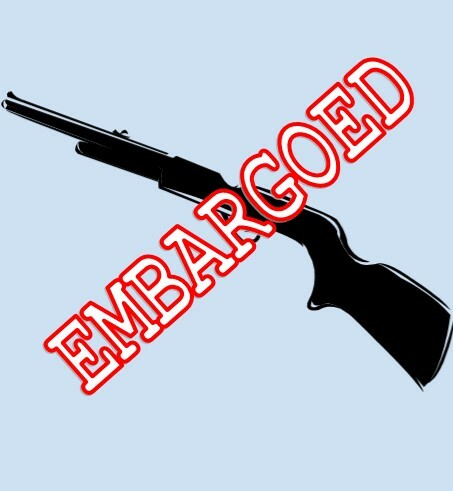 Add your ‘Embargoed’ stamp to our giant arms licence, and sign the petition calling for an arms embargo to Egypt and other countries using repression. Drop in any weekday 11.00-2.30 for a chat about these issues and to take action. Of course, Egypt is just one example of the many countries with repressive regimes that the UK exports arms to, but having a concrete example helps to humanise the issue. At Peace Hub, we want to work in a way that compliments what others in the peace movement are doing. Campaign Against Arms Trade have been calling on supporters to write to the foreign secretary calling for an embargo to Egypt – we hope our petition can work alongside this campaign. Furthermore, a small number of licenses to export components for machine guns to Egypt were revoked in 2013, indicating that the UK government may be receptive to calls for an embargo. The door is open and we hope this action can help push through it.